I like pizza. I don’t know if I love it, but I certainly enjoy it every now and then. Having said that, anytime someone suggests a carryout pizza, I am usually not keen with the choice. 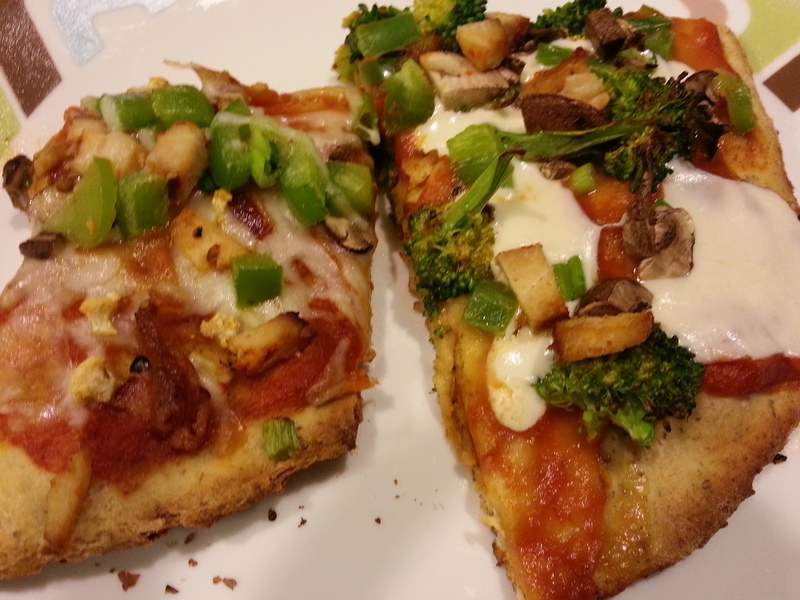 I just don’t feel good about chomping down on a slice of a typical carryout pizza – with a massive crust made with all white flour, tons of cheese (I wonder if it is all 100% dairy based), so-so sauce and a smattering of toppings that you may or may not really care for – leave alone worry about the calories! 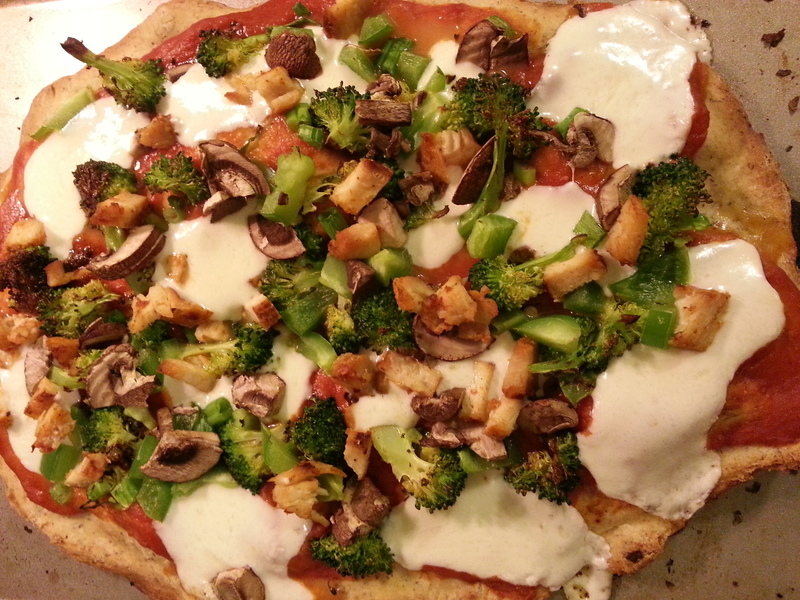 So, that pretty much leaves me with wanting (and in a peculiar way, longing) to make home-made pizza that not only tastes good but better for you! 1. Mix all purpose flour, soy flour, ground flax, salt, yeast and sugar in a stand mixer or a large bowl (I went with the bowl this time around). 2. 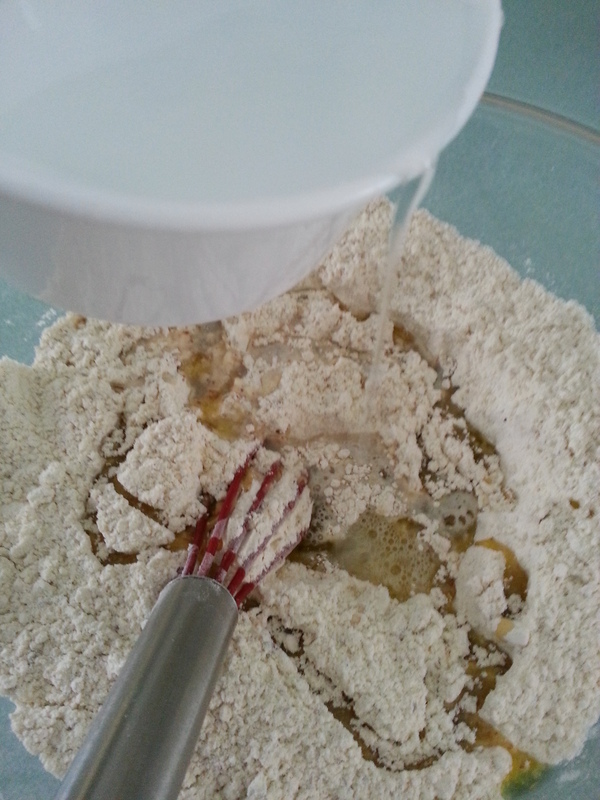 Add the olive oil, followed by warm water in a slow stream and mix to form a dough. 3. If the dough is too sticky, add a tablespoon of all-purpose or whole wheat flour. If it is too dry, add a tablespoon of warm water. 4. Knead the dough for 5-10 minutes to make a smooth dough. 5. Coat a large bowl with the additional tablespoon of olive oil. Place the dough ball there and toss to coat with oil. 6. Cover with a damp kitchen towel and leave in a warm, drought-free spot till the dough doubles in size. 7. When ready to prepare the pizza, preheat oven to 500F. 8. 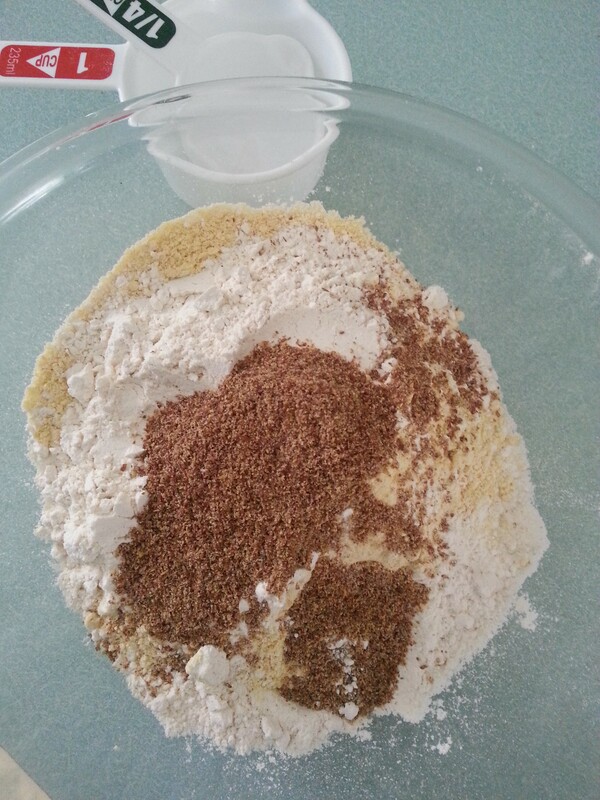 Punch down the dough and divide into two parts. 9. 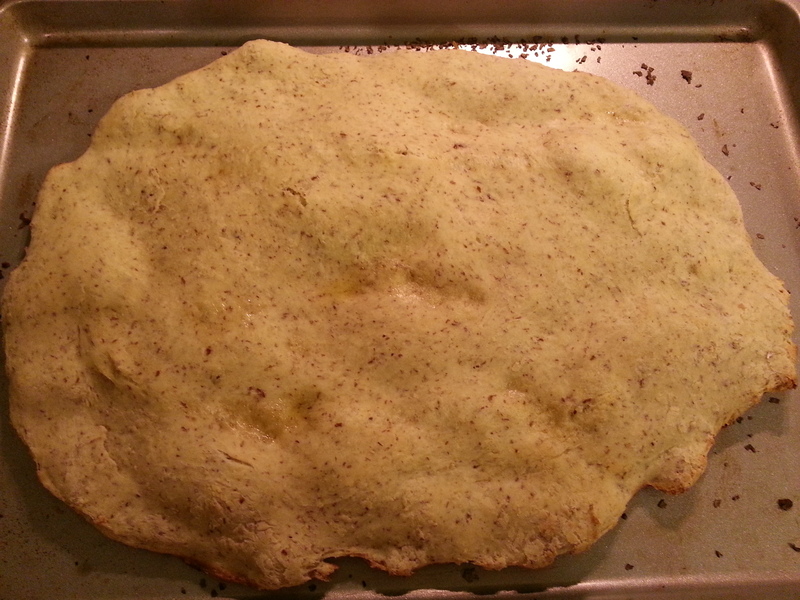 Sprinkle a cookie sheet or pizza stone with wheat bran (or cornmeal if you prefer) and flatten one part of dough to a thin crust, about 1/4 inch thick. You can flatten using the tips of your fingers. Repeat with the other part of the dough. 10. Bake the crust for about 7 minutes. Remove from oven. 11. 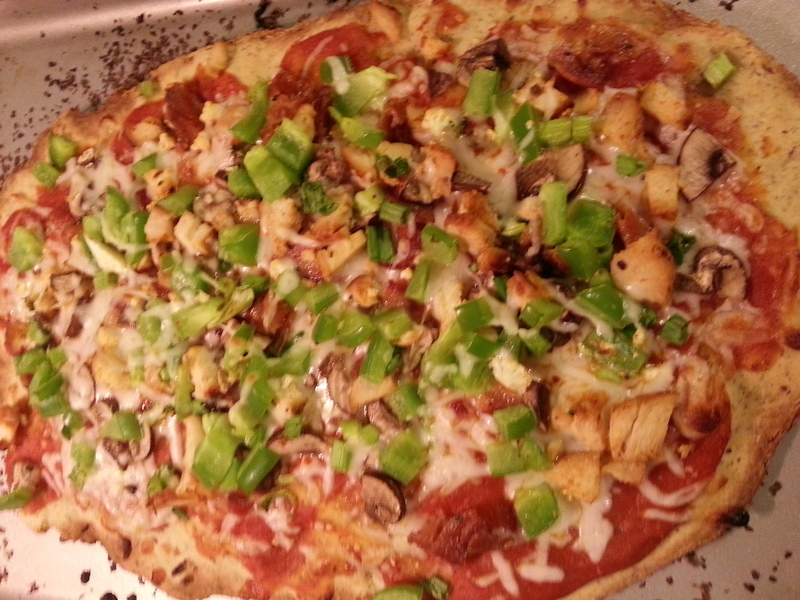 Spread about 1/2 cup of pizza sauce of your preference. Sprinkle with part-skim mozzarella cheese or sliced fresh mozzarella. Follow with toppings of your choice. 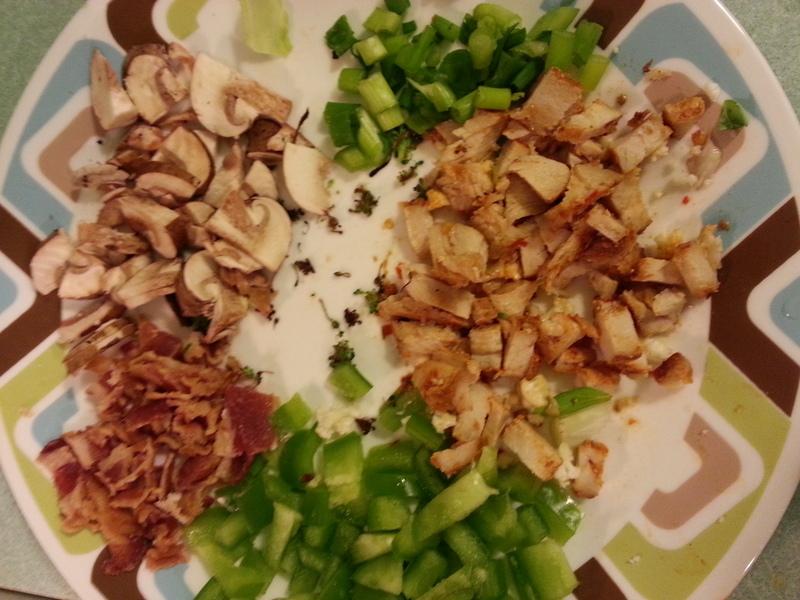 I used a combination of broiled broccoli, green peppers, baby bella mushrooms, green onions, diced cooked chicken breast and bit of cooked and crumbled center-cut bacon. 12. Bake the pizza till cheese melts and toppings (fresh veggies and pre-cooked meats) are heated through (about 5-7 minutes).